On July 7, 1985 the Baltimore Stars traveled to Birmingham to take on the Stallions in a United States Football League Semifinal playoff game before a crowd of 23,250 in attendance at Legion Field. The Stars, coached by Jim Mora, were the defending USFL Champions and had gone a combined 31-5 over the course of the league’s first two regular seasons, advancing to the league title game after each, while based in Philadelphia. With the pending move to a Fall schedule, the franchise was forced to relocate and had difficulty with the adjustment. The team’s practice facilities remained in Philadelphia while games were played before small crowds at the University of Maryland’s Byrd Stadium. The Stars started off at 1-3-1 and were just 4-5-1 before winning six of their last eight contests to finish fourth in the Eastern Conference at 10-7-1, qualifying for a playoff berth. They edged the New Jersey Generals in the Quarterfinal round to reach the Semifinal playoff. 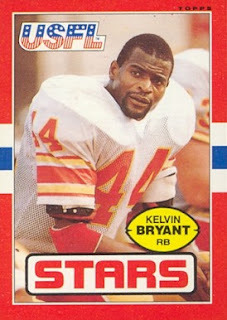 As they had been in their first two seasons, the Stars were a ball-control team on offense directed by efficient QB Chuck Fusina and featuring RB Kelvin Bryant. The defense remained tough and opportunistic. Birmingham, coached by Rollie Dotsch, was a well-balanced team that ranked second defensively and third in offensive production. QB Cliff Stoudt passed for 3358 yards and 34 touchdowns, RB Joe Cribbs ran for 1047 yards, and WR Jim Smith had 87 pass receptions for 1322 yards and 20 TDs. All-League FS Chuck Clanton intercepted 16 passes. Moreover, the Stallions had beaten Baltimore in both of their meetings during the regular season and were looking to make it a clean sweep - especially after being denied advancement to the USFL Championship game by the Stars the previous year. Baltimore struck quickly, scoring on the game’s third play when CB Jonathan Sutton returned an intercepted pass for a 36-yard touchdown. The Stars followed up by scoring again on their first offensive possession on a 30-yard TD pass from Chuck Fusina to WR Victor Harrison. Birmingham was in a 14-0 hole after a quarter of play. 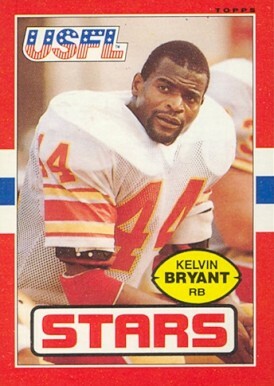 The Stars added to their lead in spectacular fashion in the second quarter when Fusina connected with Kelvin Bryant on a USFL playoff-record 70-yard touchdown pass play. There was no further scoring in the third quarter, but in the fourth quarter the Stars came through with another big play. At their own 24 yard line, Bryant broke through the middle of the line, got past the linebackers and sped 76 yards for a TD. Down by an insurmountable 28-0, the Stallions finally got on the board when WR Joey Jones caught a pass from Cliff Stoudt for a 14-yard touchdown. Joe Cribbs added a one-yard TD in the final minute of play that only made the result appear less lopsided. The Stars advanced by a score of 28-14. While playing catch-up virtually the entire game, the Stallions led in total yards (370 to 366) and first downs (21 to 14). However, the Stars came through with big plays while Birmingham averaged only 2.4 yards per rushing play (19 for 46 yards) and turned the ball over twice, once leading directly to a score, while Baltimore suffered one. Kelvin Bryant had a total of 217 yards from scrimmage as he rushed for 116 yards on 13 carries and gained 101 yards on four pass receptions. Chuck Fusina didn’t go to the air often but completed 10 of 16 passes for 210 yards and two TDs with none intercepted. For the Stallions, WR Jim Smith caught 10 passes for 110 yards as Cliff Stoudt went to the air 50 times and completed 29 for 327 yards and a TD with the one big interception. Stoudt was also the club’s leading rusher with 30 yards on 7 carries while Joe Cribbs was held to 13 yards on 9 attempts. Baltimore went on to defeat the Oakland Invaders to repeat as USFL Champions in what would prove to be the league’s last game. Hopes for a favorable financial result in the USFL’s anti-trust lawsuit against the NFL were dashed when, although the verdict was favorable, the jury awarded just one dollar in compensation (tripled to three dollars in accordance with the law) and the planned move to the Fall for ’86 never occurred.